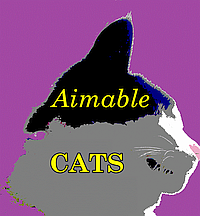 Aimable Cats is not Facebook. As such, there are some things you won't see and we won't do. We do not have trending sports/entertainment/politics news -- just cats and cat-related news. Occasionally, if one of our cats lives with other animals, we may have news about them. There will not be people posting in your feeds who do not love cats. There will not be videos of people abusing cats. There will not be posts celebrating the death, torture, or abuse of cats. We do not have games feeds. You will not be invited to play Rodent's Revenge as part of your visit to this site, and the system will not tell you how well anyone else did if they played. Our videos will not autoplay; you must click to play them. They will stop when requested. You will not see advertisements for sunglasses, floor wax, human fitness machines, work-at-home schemes, Nigerian lawyers, or products like that. 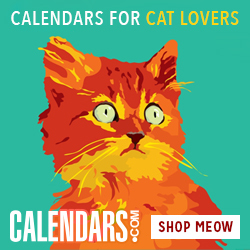 Any ads will be appropriate for catlovers (or other petlovers). 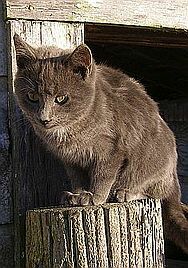 Posts will not disappear just because you have not interacted with that kitty recently. Posts will not disappear when you navigate away and come back to the front page unless newer posts have bumped those to the second page. For general news updates that are not trying to sell anything, we will not hide your post because you haven't paid us. We will not hide your post from cats who would rather see news from their family. We will not block you for sending too many (appropriate) messages, leaving too many (appropriate) comments, or spending too much time in chat. If you are actually advertising, those posts may disappear after a certain time; but if you are sharing pictures of cats, they will not. We will not hide your old posts from you. Even if it has not yet been published, or has been unpublished, you will still be able to see it. We will not delete your account because you are a cat. We will not delete your account because you are not a cat if you are a catlover. We will not track what you do when you're not on the site, other than if you got there from following an ad link on the site. What you do elsewhere online is your business, not ours. We will not assume you like all things Thailand just because you like a Siamese cat. We will not create lists of cats that you cannot get rid of even after you have emptied them. You will be able to see the names of the cats who are logged in. Comments you make on some post will not appear in all your furriends' news feeds. They will appear on that post, and in your Content Tracking. The original poster will be notified, but the notification will not appear in the main newsfeed. We will not constantly ask for a phone number. We will not load a picture in such a way you cannot see the page. We will not load a picture instead of loading a page. We will not pop up comments in a tab on a conversation you may or may not want to follow closely. We allow small gif images, such as the one attached below. We do not assume all gifs are videos, but will play animated gifs if they are not resized. We will not change your profile picture to a circle because we like it better. If you want a circular profile picture, you may upload one.